Though some might consider it overused, there’s likely no better word to describe what’s happening today among Christians in the Dominican Republic. Revival can be seen breaking out in churches, on street corners, in sports, in the media, and even in politics. Unconcerned with denominational differences and squabbles over style, churches are banding together under one unifying message—Jesus. 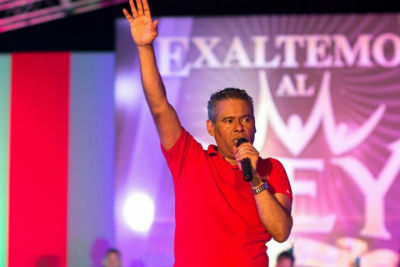 Church of God pastor Juan Santos recently led his Santo Domingo congregation to participate in a weeklong evangelism initiative, a national effort which resulted in several thousand souls won to Christ. He’s delighted to report on the incredible impact of the experience and reveal insights into the cultural transformation permeating nearly every level of society. In 2006, the focused push began. It didn’t include events held in stadiums where people gather and a mass invitation is given. This is the church going to where the people are—into homes, hospitals, and even jails. Pretty much any place where people gather became a prime setting for the churches of the Dominican Republic to share the gospel. During the second week of February, this National Evangelism and Discipleship initiative involved the greatest number of believers, across denominational lines, to date. While the actual event is just one week each year, the experience has spilled over into a passion to carry out the Great Commission throughout the year. More than ten years of churches practicing unity with a heart for the lost has had an observable effect on the culture. 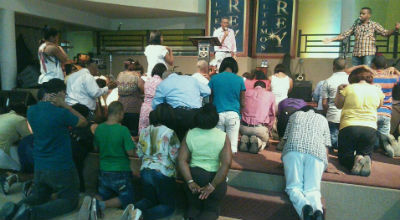 Photo: Pastor Juan preaches the gospel. In addition to the fruits of evangelism and discipleship, evidence of the spread of Christianity in the Dominican Republic is showing up among prominent national figures. Sports stars are coming to Christ, several celebrities have made confessions of faith, and the media has shown signs of being more open to faith. Of all the radio stations in the country, the Christian station is now the fourth most-listened-to on the dial. Recently, Pastor Juan began a new daily radio broadcast ministry on that same station. The highest level of government has not been immune to this wave of Christian influence. The president of the Dominican Republic assembled a group of pastors to serve as his prayer team, and Juan Santos is honored to be one of those pastors! Among the most interesting facts about Pastor Juan is that he’s a former candidate for political office. While he was not elected, the connections he made enabled him to reach hundreds of people for Christ. Looking ahead, there may be even more opportunities for Pastor Juan to influence his community and country for Christ, not only through ministry, but through government, too. Please pray for the continued advancement of the kingdom in the Dominican Republic, Pastor Juan’s radio ministry, and guidance for opportunities that may come his way. Thank you! Did you know that A.One.8 will include training experience in the Dominican Republic? Learn more about what students will be doing this summer. YOU can be a part of what God is doing in the Dominican Republic. Donate online under “Dominican Republic” at http://chogglobal.org/latin-america/. Or, mail your donation to Church of God Ministries, PO Box 2420, Anderson, IN 46018. Be sure to write Project 42.30155 on the memo line. Learn more about Global Strategy at www.chogglobal.org. This entry was posted in All Church of God, Global Strategy and tagged discipleship, Dominican Republic, ecumenical, evangelism, global, Jesus Is the Subject, Juan Santos, Latin America, missions, revival, salvation, Santo Domingo, saved, societal transformation, unity. Bookmark the permalink.